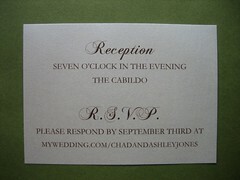 Chad and Ashley were working with a limited budget for their invitations and were searching for invitations they could print themselves. 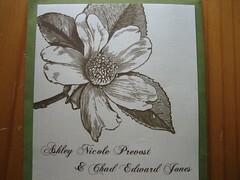 They also wanted to incorporate elements of their New Orleans nuptials, specifically magnolias. 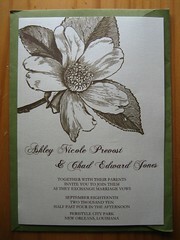 Ashley found a template on Sweet Penelope for a magnolia invite, but just the digital file was $50. They would still need to buy paper, envelopes and pay to print them. I stumbled upon Download & Print via one of the numerous wedding blogs. Basically, this site offers simple invitation templates that you can edit yourself in Word. No need for advanced graphic design programs! I took Download & Print’s Fall Magnolia template, added their information and whipped up an accompanying reception card. See the results below! 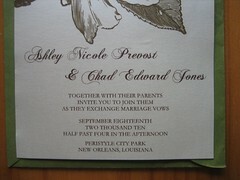 Chad and I went to Papersource and spent less than $75 on our envelopes and paper for the invitations. How you ask? We bought a pack of 250 sheets of star dust opal paper for $15! I printed them for free, at work and took them to Kinko’s to get cut (less than $20 total). 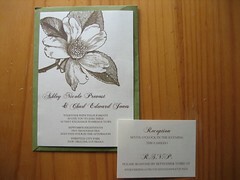 All that’s left is postage ($66.00) bringing our total invitation cost to ~ $161 dollars. That’s half of what we budgeted, and we budgeted on the super cheap side. I’ll momentarily mourn the lack of letterpress, but only as long as it takes me to spend the $140 we saved (which wouldn’t have even bought letterpress…) on something else. Thank you so much for a) finding this free little gem b) doing all the work ups to make it perfect. They look so good!